Love the warm and wise words of Max Lucado? 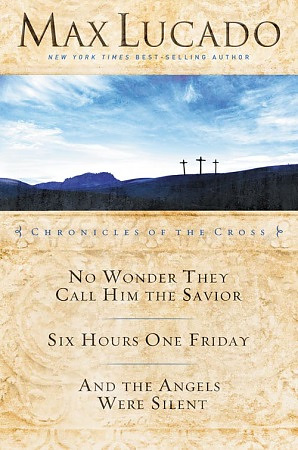 This volume includes three of Max Lucado's best-loved works: No Wonder They Call Him the Savior, Six Hours One Friday, and And the Angels Were Silent. In No Wonder They Call Him the Savior, best-selling author Max Lucado invites readers to meet the blue-collar Jew whose claim altered a world and whose promise has never been equalled. Readers will come to know Jesus the Christ in a brand new way as Lucado brings them full circle to the foot of the cross and the man who sacrificed His life on it. Then, in Six Hours One Friday, readers learn that they don't have to weather life's storms alone, but that God promises to be with them no matter what they are facing. He does this because of what happened in only six hours one Friday so many years ago. Finally, come face-to-face with the Savior during His final week on earth and learn about the loving purpose and deliberate intent that went into His every action, His every word in And the Angels Were Silent. Max Lucado 3-in-1 collection – Chronicles of the Cross by Max Lucado was published by Thomas Nelson in March 2015 and is our 9429th best seller. The ISBN for Max Lucado 3-in-1 collection – Chronicles of the Cross is 9780718034955. Be the first to review Max Lucado 3-in-1 collection – Chronicles of the Cross! Got a question? No problem! Just click here to ask us about Max Lucado 3-in-1 collection – Chronicles of the Cross.